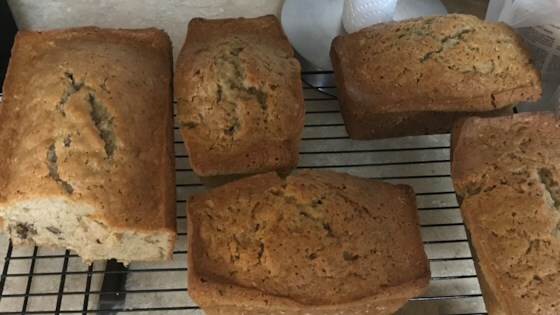 "Quick, easy, delicious zucchini bread. Freezes very well so no fear with the overflowing garden veggie. You may omit the walnuts if you wish." In a large bowl, sift together flour, baking powder, baking soda and salt. In a large bowl, beat together the sugar and oil. Stir in the eggs one at a time, beating well with each addition, then stir in the vanilla. Blend this mixture into the flour mixture, alternately with the sour cream; stir just to combine. Fold in the zucchini and nuts; mixing just enough to evenly combine. Pour batter into prepared pans. Bake in preheated oven for 80 minutes, or until a toothpick inserted into the center of the loaf comes out clean. We thought this was good, but we've had better zucchini bread. I won't be making this again. I will try another recipe from this sight. Sorry! Everybody compliments me on how moist this bread is. This is one of my favorites. I add a little extra zucchini and sour cream.